Although these days the realm of collectible Star Wars cards might be more active on your phone or tablet, the movies have been forever linked with the world of trading cards ever since they came out. A new book wants to stoke the flames of your nostalgia for those heady days of card collecting, and we’ve got a look inside. Abrams’ latest Star Wars card collection book, from Topps and Gary Gerani, looks back at the 1995 Widevision trading card series—an extra-wide gimmick version of their usual Star Wars cards, designed to match the proper aspect ratio of the films themselves. 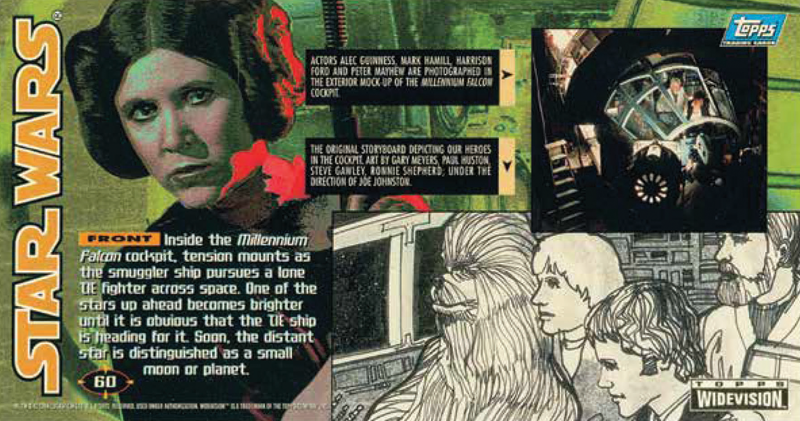 While the fronts of the cards featured pivotal moments from the original trilogy, the backs featured concept art, behind the scenes factoids, and even exclusively-written commentary from George Lucas in some cases. For the first time since their release, Star Wars Widevision: The Original Topps Trading Card Series gathers every one of the Widevision series cards in a new volume, so even if you didn’t collect them all the first time round, you can see them in all their glory. There are even a few actual cards included with the book, for good measure—check some of them out below, and don’t forget to open the images up in a new tab to see them in their full widescreen glory. Star Wars Widevision: The Original Topps Trading Card Series is available now. How the Hell Is This JPG of Han Solo Worth $225?